*Specific combinations of inputs and outputs can be active simultaneously. Refer to the schematic for all possible I/O combinations. CHRP 2.0 schematic diagram (152kB ). CHRP 2.0 parts layout (172kB ). CHRP 2.0 Gerber files (148kB ). CHRP 2.0 parts list (84kB ). We call it CHRP ('chirp'). 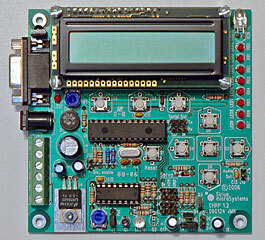 CHRP was created to help highschool students learn about electronics and computer technology in a fun, hands-on way. It's also great for introductory to advanced college and univeristy courses. The capabilities of the CHRP board are designed to grow as the students progress, providing level-appropriate challenges for each grade (10-11-12). CHRP is cost effective, since students build it in stages, adding new parts, and new capabilities, each year. CHRP is versatile. You can use CHRP to create rolling robots, walking robots, animatronics, alarm circuits, games, sound generators, weather stations, automated houses, computer peripherals, data loggers, and much more! Use the CHRP construction activities to learn about electronic parts and circuits as you build and test parts of the CHRP board. Learn about resistors, capacitors, diodes, LEDs, power supplies, series circuits, and parallel circuits. Use the CHRP programming activities to learn how to write programs that control outputs and sense inputs using PICmicro® assembly code. Use the built-in and tested I/O circuits on the CHRP board to debug programs separately from circuits, reducing potential errors and saving you time. The CHRP has so much circuitry on-board that you can use it as a stand-alone controller in many applications. Just connect it to your hardware and program it to do what you whatever you want. For CHRP activities, go to the CHRP page. *Not all inputs and outputs can be active simultaneously. Refer to the schematic for possible I/O combinations. CHRP 1.2 schematic diagram (148kB ). CHRP 1.2 parts layout (576kB ). CHRP 1.2 Gerber files (156kB ). CHRP 1.2 parts list (44kB ). We call it CHRP ('chirp'). CHRP was created to help highschool students learn about electronics and computer technology in a fun, hands-on way. It's also great for introductory college and univeristy courses. The capabilities of the CHRP board are designed to grow as the students progress, providing level-appropriate challenges for each grade (10-11-12). CHRP is cost effective, since students build it in stages, adding new parts, and capabilities, each year. CHRP is versatile. You can use CHRP to create rolling robots, walking robots, animatronics, alarm circuits, games, sound generators, weather stations, automated houses, computer peripherals, and much more! Use the CHRP assembly activities to learn about electronic parts and circuits as you build and test parts of the CHRP board. Learn about resistors, capacitors, diodes, LEDs, power supplies, series circuits, and parallel circuits. 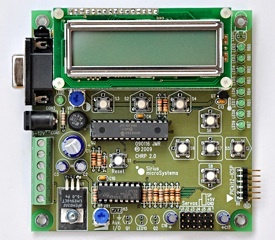 These three different variations of the CHRP board correspond to the hardware requirements and software sophistication of the programming activities.